Entries from Digital Intelligence tagged with "line"
Mobile messaging app LINE has launched a new standalone app called LINE Moments that lets people edit their own videos. Messaging app Line is planning a dual Japan-US IPO, which could raise as much as $1.14 bn, which could make it the biggest tech IPO of 2016. Japan-based messaging app Line has launched its own selfie filter app, imitating a popular feature on Snapchat. WhatsApp’s user-base has now been increased to 600 million, as the Facebook-owned chatapp stroms ahead of LINE and WeChat as the most popular chat app in the world. Salesforce ExactTarget Marketing Cloud has teamed up with mobile messaging app LINE, providing marketers with a range of direct mobile marketing solutions for the platform for the first time. Japan’s social media landscape is diverse and fragmented, with many big players battling for dominance (and working together). Facebook and Twitter are popular, but local players Mixi and Gree also have lasting appeal across Japan, while mobile and social gaming sites are also hugely popular. 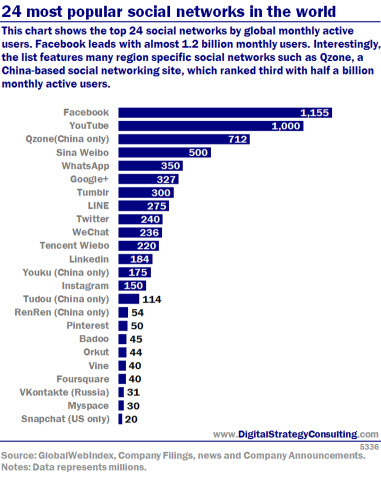 We look at the top 6 social networks in Japan.